Published Dec 16, 2008 by New Riders. Part of the Voices That Matter series. In this video (DVD-ROM), noted web design expert, author, and consultant Aarron Walter demonstrates a holistic approach to building websites. He shows web designers and developers how to help audiences find their web content and rediscover it later. 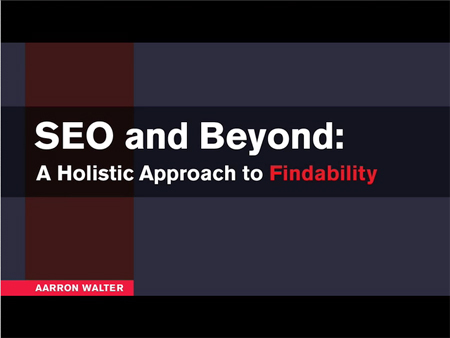 Viewers will learn the basic concepts behind SEO and findability, as well as practical web standards by watching Aarron take a real world project from paper to pixel.